Deprecated constructor. Please avoid usage of this constructor. Constructs a hollowed solid from the solid S by removing the set of faces ClosingFaces from S, where: Offset defines the thickness of the walls. Its sign indicates which side of the surface of the solid the hollowed shape is built on;. if Join is equal to GeomAbs_Intersection, then the parallels to the two adjacent faces are enlarged and intersected, so that there are no free edges on parallels to faces. RemoveIntEdges flag defines whether to remove the INTERNAL edges from the result or not. 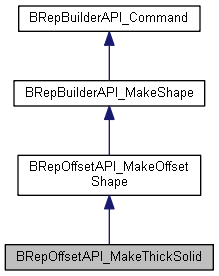 Warnings Since the algorithm of MakeThickSolid is based on MakeOffsetShape algorithm, the warnings are the same as for MakeOffsetShape. Constructs solid using simple algorithm. According to its nature it is not possible to set list of the closing faces. This algorithm does not support faces removing. It is caused by fact that intersections are not computed during offset creation. Non-closed shell or face is expected as input. Returns the list of shapes modified from the shape <S>.